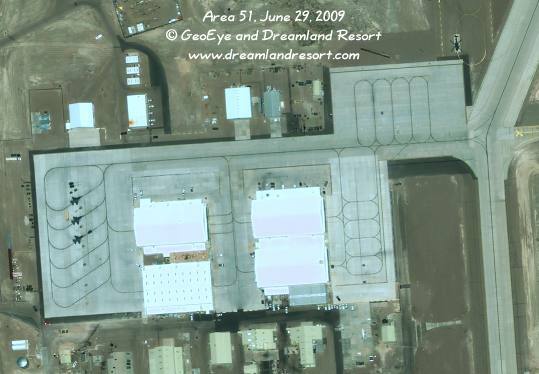 Below are some clips from our new 2009 Area 51 Satellite image, taken by the GeoEye-1 satellite on Monday, June 29, 2009 at 11.26am PDT. 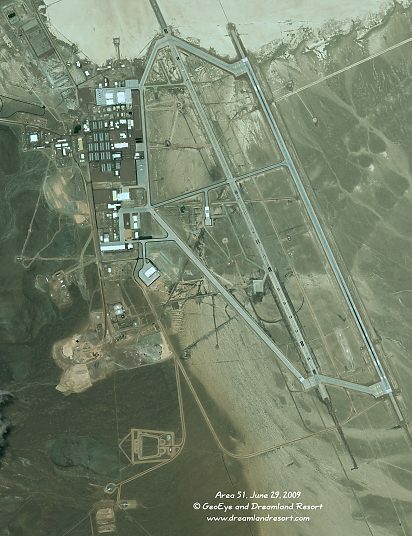 The resolution of the original image is 0.5 meter, making it the highest resolution satellite image of Area 51 ever published. The individual clips mostly show significant changes since our 2007 Satellite Image. This is a Dreamland Resort Exclusive! This new satellite image was taken upon our request, and paid for with donations from our readers. All photos are © 2009 GeoEye and Dreamland Resort. Publication of this material outside of the Dreamland Resort web site is strictly prohibited. A new racetrack-like structure has been constructed just northwest of the shipping and receiving facility. The three tracks have a length of 0.5, 1.0 and 1.5 miles. The longest straight leg is 0.7 miles long. There has been some speculation about the track being used for UAV testing etc., but it appears that, as so often, the truth is much more mundane. Similar tracks have recently been constructed at other bases, including Nellis AFB (Area 2), Creech AFB, Luke AFB, Davis-Monthan AFB and others. They appear to be running tracks for physical training of base personnel. Click in the preview above for a full 0.5 meter high-resolution version. 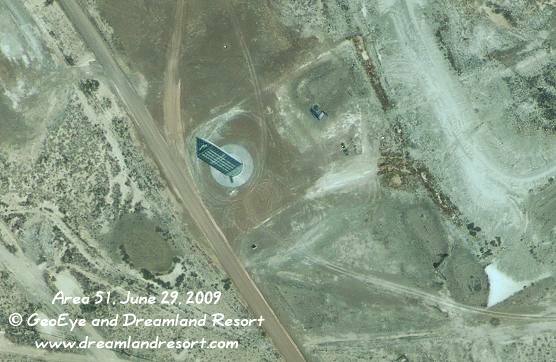 This new tall structure near the RCS range at the north end of Area 51 was built between Sept. 28, 2005 and January 17, 2006. It is triangular in shape, approximately 155 ft. tall and the three sides are about 30 ft. wide. Comparing various satellite images it appears that the tower can rotate around its vertical center axis. There are no support buildings nearby, but the proximity to the RCS rage could suggest that it is controlled from there. The clip above is the full 0.5 meter resolution of the new satellite image. Click the image for an enhanced version with a "virtual" resolution of 0.16 meter. It shows quite a bit more detail. This clip shows the new hangar near the south ramp area, and its connection to the flightline. 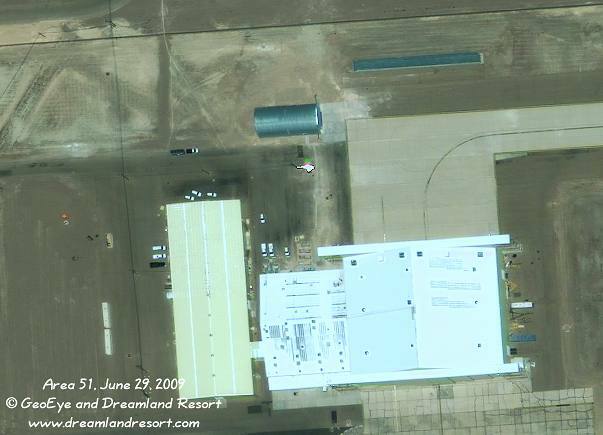 In our 2007 satellite image the hangar was still under construction. We discovered construction of this hangar from Tikaboo on June 10, 2007. Parts of the south ramp are still being re-paved. Click the image for a 0.5 meter high-resolution clip of the hangar. A new metal quonset hut has been added near the ramp north of Hangar 18. 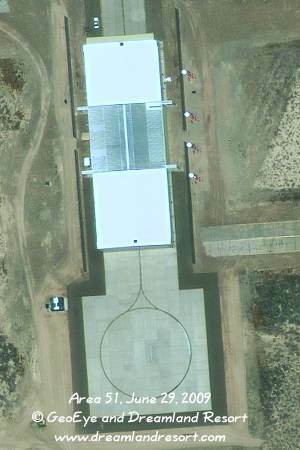 The size of the new building is approximately 100x50 ft, barely wide enough for a smaller-size UAV. It appears to be connected to the existing ramp with a somewhat temporary-looking addition to the ramp. Other than the new quonset hut there is no visible change around Hangar 18. The resolution of this clip is 0.5 meter. Click the image for a digitally enhanced 0.25 meter high-resolution version. 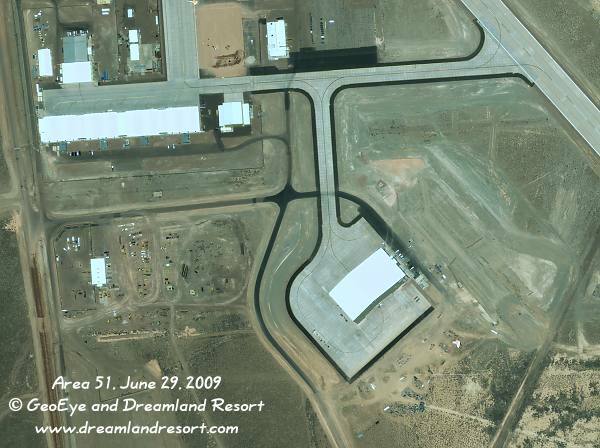 The North Ramp, which was just being re-paved in our 2007 Satellite Image, has been finished. Three F-16 can be seen parked on the ramp. One of the three security helicopters can be seen on the pad in the upper right hand corner. Besides the finished ramp, there is little visible change since 2007. The resolution of this clip is 1 meter. Click the image for a full-size 0.5 meter high-resolution version. 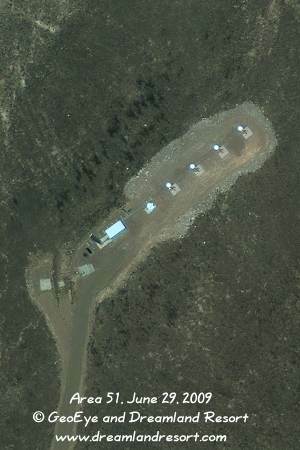 Two new identical radio sites were added at Area 51 in 2008. The site on the left is located on a hill at 37�'40"N/115�'22"W, in direct line with runway 32. The buildings and antennas near the access road have been there for a while. The four towers in the north-east are new. The towers are about 55ft. tall. We discovered that site on June 1, 2008 from Tikaboo Peak. The second, apparently identical, site was added just east of the recently extended Hangar-19. We currently have no further information on the purpose of these sites. The resolution of the above clips is 0.5 meter. Click the images for a digitally enhanced 0.25 meter high-resolution version, and for some photos of these sites from Tikaboo Peak.